​Name a more iconic duo, I'll wait. 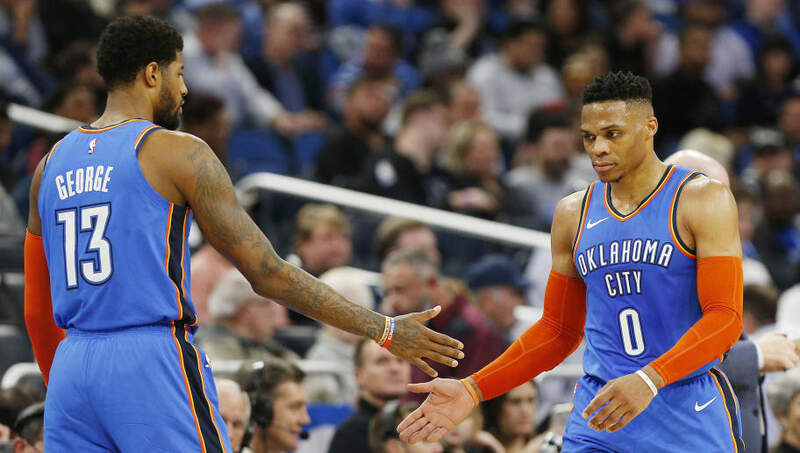 With the Oklahoma Thunder surging into the All-Star break thanks to the outstanding leadership of Paul George, ​Russell Westbrook felt slightly overlooked. The All-Star put together one of his best performances of the season on Monday night, recording a triple-double for the tenth straight game. Only Brodie can make 21-14-11 look casual. With 10 straight triple-doubles, Westbrook now passes Wilt for the longest such streak in NBA history. Not to be outdone, however, ​George poured in an absurd 47 points of his own, but also got his teammates involved plenty. PG13 had 12 boards and 10 assists and just barely missed the half-century mark himself. This marks the first time in NBA history two teammates have recorded triple-doubles with 20-plus points in the process, and the Thunder needed all of them. OKC only defeated Portland by nine points despite the ridiculous offensive output by one of the best scoring duos in all of basketball.